3 photographic prints : b&w; ; 5 x 7 in. 1 negative : b&w; 4 x 5 in. Published in Japanese section of Rafu Shimpo, March 21, 1951. A man, Kabuki actor Kuroemon Onoue, sits and stands next to a lantern and mural at Kawafuku restaurant in Little Tokyo, Los Angeles, California, February, 1951. 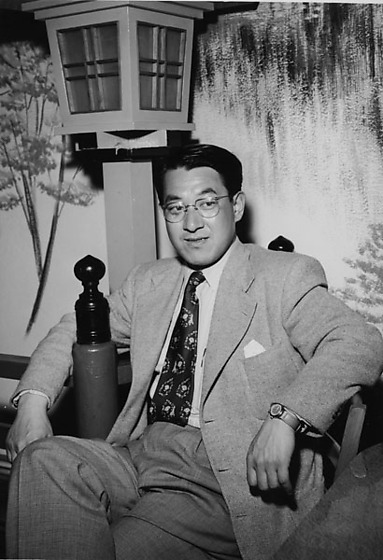 Kuroemon wears a light-colored suit , dark patterned necktie, and eyeglasses as he relaxes in a chair. He stands in front of a bridge-like railing. Written on original negative envelope: Kikugoro & Kuroemon at Kawa Fuku -- Kabuki Actor.